The whole of you. From head to toe.From skin to core. Every little scar, every little mark. Embrace every part that you think is too fat or too skinny. Every area that you’d rather cover, and every area you want to flaunt. Embrace the extra weight that you’ve put on or the weight you simply can’t gain. Embrace the ability for your body to change, and the truth that it has. Embrace everything that’s on and in your body, for it reflects the journey you’ve had, and the journey you are on. Embrace every little flaw that you think is a flaw – the bumps, the curves, the blemishes, the dimples or the moles. The thigh gap or the lack of one. Embrace every single dislocated joint, every set of horribly painful muscles. Embrace the faulty collagen that once made you feel at fault. Embrace the complexity of the cells that form you. Embrace the simplicity of your breath. Embrace every weakness, every strength that you have within you. Embrace the limitations, for that’s the first step towards working with your body and finding opportunities. Embrace your emotional, mental, physical and spiritual self because they make you the you that you are and the you that you’re about to become. Embrace your experience – it has torn you down into pieces, ripped all the courage out of you and built you up into a strong and beautiful person that you are. Embrace the conscious and the subconscious story you’ve written so far. Embrace all that you are creating from here on. Embrace every fragmented part of you that needs a safe spot to come together and bloom again. Embrace those cracks in your heart, those holes in your soul. Embrace that part of you which still needs to develop, learn and grow. Embrace the power within you to do all of it. Embrace the fear, the guilt, the despair and the grief that you have overcome. Embrace all that is still left to overcome. Embrace each of those disturbingly dark emotions that you feel, for that is where the alchemy begins. Embrace your deeper need to heal, for that is how the world starts to heal. One person at a time. Embrace your need for boundaries and personal space. Embrace your need for valuable connections and healthy relationships. Embrace your need to be what you want to be, and not what the world wants you to be. Embrace the disorder in your, the clutter, the chaos – it is what makes you human. Embrace all of it. Embrace your skills, your talents, your passion and your drive to keep moving forward. Embrace your need to go slow. Embrace your ability to know. Embrace the possibility to be lost, for you won’t always have the answers. Embrace the fact that you are unique, that you are different – like everyone else, and yet not. Embrace the sensitive being that you are. Embrace the truth that you feel more. Embrace the light and the shadow within you. Embrace the love and the pain that fills you up every single day. Embrace all the muddle and the uncertainty that you face, for each of us feels this way at some point. Embrace all that you are and all that you are not. Embrace your reality, your story and your dreams. 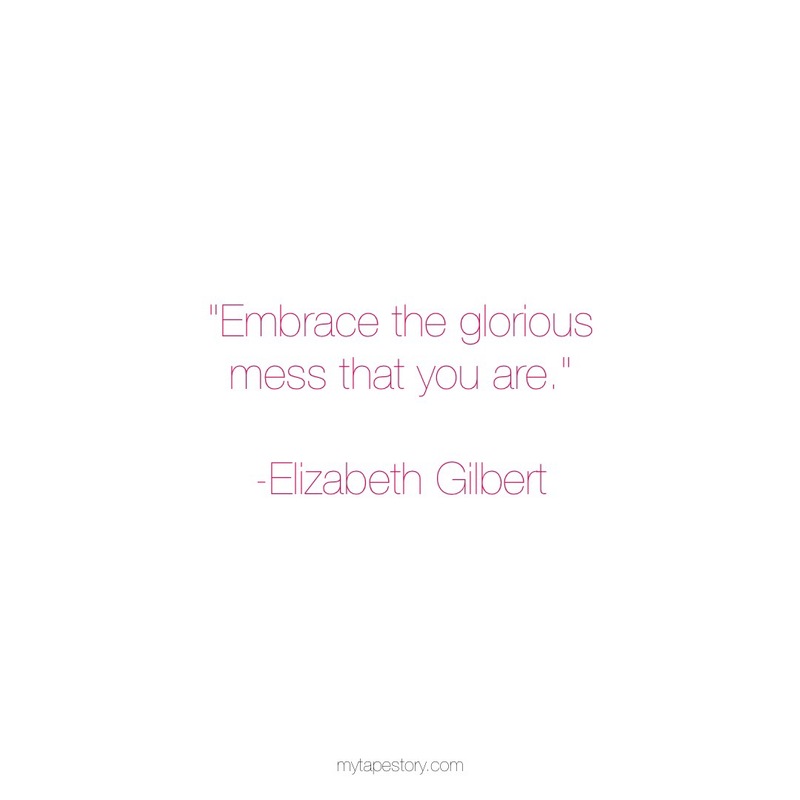 Embrace the perfectly imperfect and glorious mess that you are!